Well, it’s that time of year again when the weather is getting cooler and we are turning to comfort food, soups and stews. Many families make this many different ways, but the recipe below is my version. 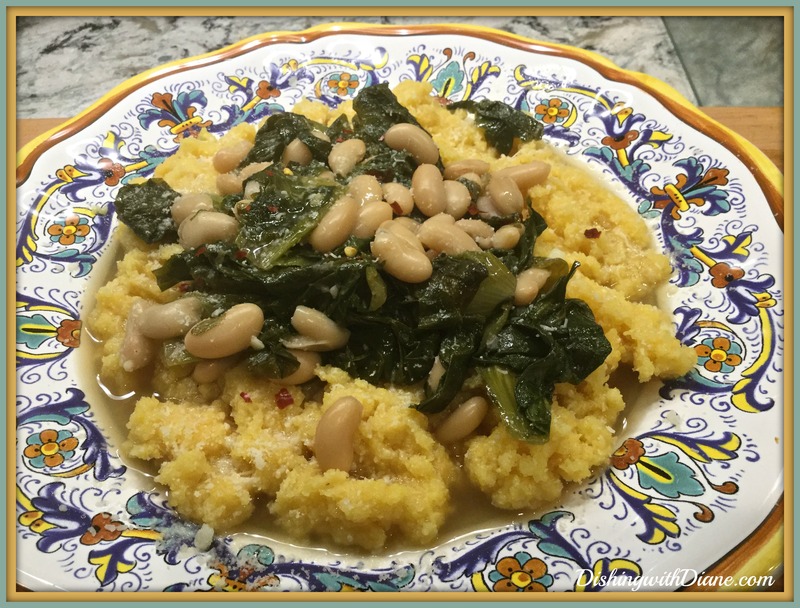 Bob is not a big fan of just escarole and beans, so today, just for him, I served it over soft polenta and it was a big hit. The important thing to remember about escarole is WASH IT WELL. I rinse mine in a large bowl of cold water at least three times. A lot of dirt hides in the leaves and you don’t want dirt in your soup. But here is my traditional recipe. I usually serve this without the polenta and just a nice warm piece of rustic crusty bread for dipping. I hope you give it a try on a cool fall night. A hearty meal in 15 minutes. Add the escarole and stir to coat with the oil. Sauté, stirring occasionally, until the escarole wilts. Add another pinch of salt. Stir in the beans (1 ½ cans whole and ½ can mashed) * you can mash by hand or in the food processor. Lower the heat, and add the chicken broth or water (more if you prefer it soupier). Serve with a drizzle more olive oil over each serving, add grated cheese and more red pepper flakes (optional). This entry was posted in Recipes on September 26, 2016 by aries041158. I love this recipe. My family made it the same way. They didn’t use the tomato paste but I’ve been doing it that way for a long time. I also …just ocean a while… sauté a little anchovy int the oil, garlic, and red pepper flakes. Adds a “nutty, toasted” taste that adds something the French wild call a “je ne sait quoi”! ;-). One of my favorites on a cold evening. Thanks for posting this. Hi Mike, I’ll have to try the anchovy in the escarole. I always use anchovies when I make broccoli & macaroni and top it with toasted breadcrumbs. Thanks for the comment.